Yes, back by popular demand (erm, by 2 people, including me) its the train thread..
Anorak's and trains go hand in hand really, fill a thermos with some lovely soup, don the anorak, pick up a pen and pad, buy a platform ticket (very important this, you don't want to be done for fare evasion) and spot away. So yeah, 05Nov, NRM in York. I'm very excited, are you all excited? davo wrote: Yes, back by popular demand (erm, by 2 people, including me) its the train thread..
As much as I like trains, I've never quite had the spotter urge. I think my railwayphilia centres upon old stations that aren't there any more. And maps of old stations that aren't there any more. And maps of stations that are still there. And maps of tracks. And timetab... oh God. Ah, yes, that should have come with a disclaimer, while its easy to sit here and reflect at the grand of age of 32 about my youthful days being dragged countrywide by my train driving/model railway making/train fanatic father, aside from maybe a few numbers sneakily seen from a moving 125 somewhere near Derby, i have never partaken in the grand hobby of actual Trainspotting. Thanks for starting the train thread, Davo. I owe you a tenner. Is there really such a thing as a platform ticket? Woh, I didn't know that! How much do they cost? Does it depend on how far the platform is from the ticket barrier? davo wrote: So yeah, 05Nov, NRM in York. They used to cost about 20p at Milton Keynes station, as my mother used to get them to help me with my luggage when I was visiting from uni. I've never seen them anywhere else, but presumably they have them at all stations with barriers. I don't know if they still exist in these franchised days, but they were around for years in the BR days. As Woodbine said, they weren't very much 10p-20p, i think it depended on the station and a lot on the staff too i should imagine. I guess they still exist because it says you might need one in Network Rail's guidelines for rail enthusiasts. Which, I hasten to add, I had never previously looked at before I googled "platform ticket" just now. They have platform tickets at Leeds, or at least I'm fairly sure I saw a machine next to the booths last time I was there. I cannot say that I have seen very many though. Then again I am not sure I can think of that many stations with barriers. I have a platform ticket for Llanfairpwllgwyngyllgogerychwyrndrobwllllantysiliogogogoch. Leeds station is a funny place isn't it. It's awful but some of the platforms are dead nice - like Platform 6 where I caught my train from yesterday. Going from the oppressive main bit of the station to that was like running out to the seaside. Well, sort of. Anyway, my train journey from Leeds to London was brilliant yesterday. A really quiet coach, one of those old-fashioned GNER trains with the brown worn-out seats, the weather changing constantly making the views from the window quite surprising and lovely, I had a new book to read... It was really good. Terrifically expensive, more like. It's Ãƒâ€šÃ‚Â£98 if I want to go to London and back in about ten days' time, which I do. I know it would be cheaper if I'd booked in advance, but it's spur of the moment innit? The other choice is Ãƒâ€šÃ‚Â£30 on the National Express. Much cheaper but I'll want to kill myself about eight hours in. I remember Leeds station being terrifyingly massive the one time I was there. Somehow I never got lost, despite being shitfaced at the time. I'm going on a couple of routes I've never been on before next weekend, London to Nottingham and London to Brighton (oh hang on, I have done Brighton to Gatwick Airport) and I always look forward to seeing parts of the country I haven't before. I've grown to love the Edinburgh to London journey, despite it going through some grim places (Doncaster, Peterborough etc), the view as you come into and leave Durham is a particular favourite. Yes, it's got quite a bleak, functional feel to it, Leeds station, with all that grey. I think Nottingham might be my favourite station. The platforms have a slightly shabby feel but I like their expansiveness, their open, uncrowded breadth. And the foyer and front are wonderful, just wonderful. I miss the old massive arrivals board in Central Station, as much as one can miss something like that. It was a landmark in its own right. chris_ps wrote: I'm going on a couple of routes I've never been on before next weekend, London to Nottingham and London to Brighton (oh hang on, I have done Brighton to Gatwick Airport) and I always look forward to seeing parts of the country I haven't before. I don't mean to be a party pooper but both those routes are really dull. That view of Durham you mention is ace, though. I was at the Midland Railway Centre (of Indietracks infamy) today. It's 1940s weekend, so they had lots of people dressed up as WWII tommies, and posters on the walls saying "Hitler won't issue a warning - carry your gas mask at all times" and stuff. It was all quite jolly. The ambience was just broken slightly by the radio in the buffet playing 'Teenage Dirtbag'. I just spent the last 4 days in North Wales, aside from it being one of the most relaxing few days i've had in years and the scenery being jaw-droppingly beautiful, they also have lots of lovely trains to go on. Thursday afternoon we took the rack railway 2/3 of the way up Mt. Snowdon (the line to the top is shut right now for building work - and there wasn't even a replacement bus service) it's still about a 2 hour round trip, it just ambles up at a very nice pace, it's so open and the views are magnificent, it was only a single carriage and engine and they had to have someone sitting at the front to shout at the sheep and move them out of the way as they were grazing on and around the tracks. You get about half hour turn around up there then back down again, excellent trip. Friday morning we did the Ffestiniog railway, slightly different in style, it started from a lovely little seaside town, Porthmadog, and worked it's way through the fields and woods across to Blaenau Ffestiniog, the way there we pretty much had a carriage to ourselves, it was a full train, 6-7 carriages, being pulled by the famous double boilered engine that they use there. At Blaenau Ffestiniog, the National Rail uses the same station and there was a Super Sprinter arriving at the same time we did, turns out this is timed to connect with the return journey and we had to suffer a group of overly loud, know-it-all Americans on the way back. Theres also a second railway run by the same company which currently runs from a place called Rhyd Ddu to Caernarfon, we stayed about 5 minutes walk from Rhyd Ddu but didn't get a chance to actaully ride the railway, there are plans to extend this from Rhyd Ddu the other way all the way to Porthmadog and i guess connect this with the Ffestiniog. Colin wrote: I miss the old massive arrivals board in Central Station, as much as one can miss something like that. It was a landmark in its own right. Has that gone now? Poo. 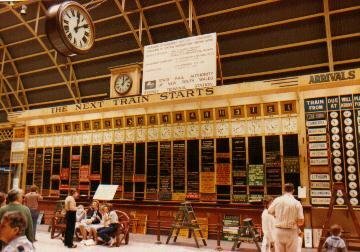 There used to be an ace departures board at Sydney Central. It was the 80s when it got ripped down and replaced with boring computer screens, and I still miss it.